Home›Marketing›A Few Hours With Seth Godin and Here's What I Learned. 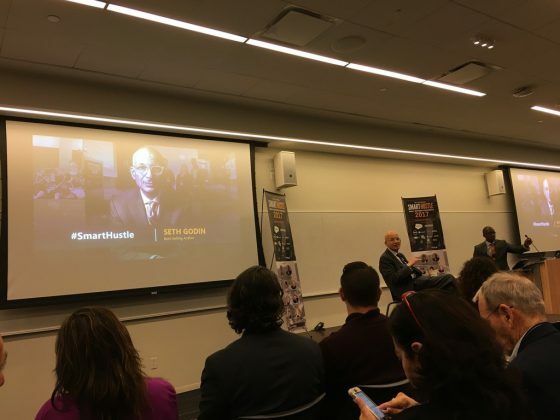 I had the privilege of hearing Seth Godin, author of 18 best-selling marketing books, including Purple Cow, Tribes, and Permission Marketing, speak at the annual “Smart Hustle Small Business Conference”. Produced by Ramon Ray, the conference was tremendously valuable, and I’d like to share what I found most useful. · Find the smallest number of viable people who want your product. · Discover those who will trust that you will do it. · Deliver a lot of value to them. “How do you do better work?”, asked Seth. “Get better clients!”, he answered. He then went on, giving us the reasons: “You’ll do better work and contribute more.” That is the heart of Seth Godin’s hope for us. He wants us to work in a way that is meaningful to each one of us as individuals. That is the way to live a more fulfilling life, and contribute to a better world. Seth later asked us to distinguish between making a good decision and getting a good outcome. This was eye-opening: “A bad outcome doesn’t mean you made a bad decision”, he said. He also doesn’t feel that when you fail, it’s bad. You may have to fail many times before you succeed. You need to keep treading on your path. If you quit, you’ll never succeed. Seth Godin also offered us an illuminating analysis of social media — and how many business professionals may be misguided in this area. He commented that they run themselves ragged, constantly and frantically posting, trying to get more “likes”. “What does getting more ‘likes’ really do for your business?”, asked Seth. He pointed out that it means little if it doesn’t translate to sales. Social media is running us, he told us. “If you check what people say about you, think about you, that’s not your audience, that’s social media’s audience. They are manipulating you to use their social media.” He then spoke about the cost of buying attention on these channels. Analyze whether it’s worth it. Consider the cost in time and energy. What price is there to your peace of mind and relationships if you are always glued to your phone or tablet — hurriedly pouncing on every ping you hear? He then changed gears. He spoke about fear and the voice in our head that says, “I don’t know the best path.” Seth tells us to dance with the fear, it’s our compass. Listen for the sound in our head that says, “it will not work.” If you are a surgeon, and you hear that voice, yes, you should obey. But for most of us, in the types of jobs we have, we don’t suffer the big bad results that may arise in surgery. “You’ve got to know where to put that fear — in your pocket”, he tells us. As Seth tells us in Purple Cow, if you try to be like everyone else, you’re invisible. He urges us to be original — the unique, one and only each of us truly is. It’s clear that Seth Godin is an original, always challenging a status quo that makes no sense, and directing us to be true to ourselves and others. He inspired me very much. I hope his words do the same for you.